Rack to drive for sliding gates weighing up to 1200kg for domestic and industrial gates. 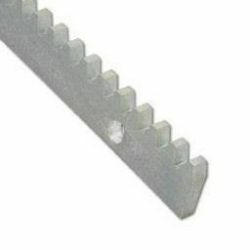 Galvanized strip in silver, complete lock for easy assembly. Module 4 - to drive domestic and industrial companies CAME. We sell a notched strip in lengths 1m. Complete with spacers and screws (3 per 1m). Must be ordered a bit more bars than the distance between the posts of entry. If the light entering is equal to 3.5 m, order 4m strip. If the light entering is equal to 4m, 5m strips must be ordered. This is necessary because of the need for space for the installation of surge limit switches.